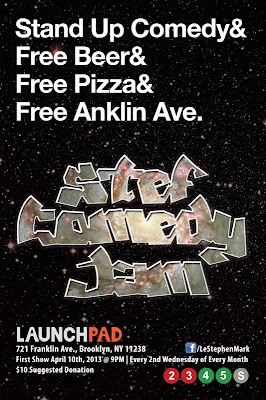 - The folks at LaunchPad are excited to re-open their backyard this Friday (see above flyer). Complete slate of this weeks's events is below. - Five Myles launches their Summer SpaceProgram this weekend. - The Crown Heights Film Festival is now accepting submissions. New York based jazz drummer and composer Alex Wyatt has been busy on the New York music scene in recent years. Since earning a B.F.A. from The New School for Jazz in 2005, Alex has performed live or recorded with jazz artists Kevin Hays, Gilad Hekselman, Jon Irabagon, Yeahwon Shin, Massimo Biolcati, Joe Martin, Greg Ruggiero, Frank Locrasto, Logan Richardson, Nir Felder, and Curtis MacDonald, among others, and with pop artists such as My Cousin, The Emperor, WYATT, Jason Liebman, Lauren Molina, and Blake Whyte. Alex’s new recording, entitled There's Always Something, is his first album as bandleader and composer. It features nine original compositions, and a sextet of his closest musical colleagues, some of New York’s finest up-and-coming jazz instrumentalists: tenor saxophonist Kyle Wilson, alto and soprano saxophonist Masahiro Yamamoto, pianist Danny Fox, guitarist Greg Ruggiero, and bassist Chris Tordini. All of these gentlemen are recognized performers and composers in their own right. 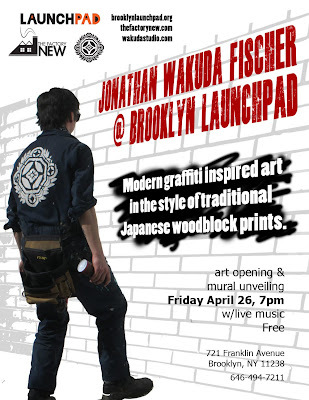 The "Don't Be Like Roy" Campaign is a monthly art event that takes place at Launchpad (brooklynlaunchpad.org), mainly featuring local artists in New York and Boston. This month focuses on the theme of "memory." 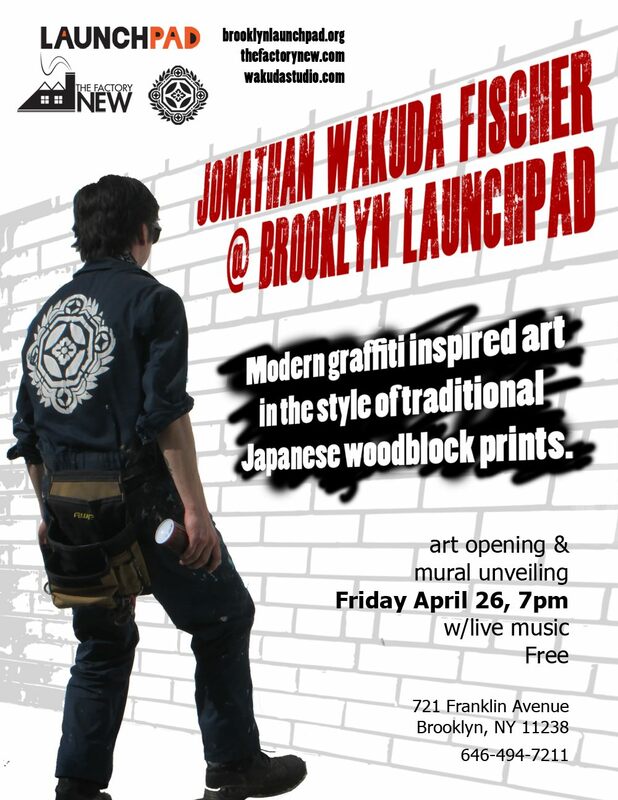 Modern graffiti inspired art in the style of traditional Japanese woodblock prints from WAKUDA art opening & mural unveiling with live music. Pulsewave started in March 2006 as a way for chip music composers from all over the world to showcase their live music, paired with live visuals, on a monthly basis. Chip music is a kind of music made from archaic hardware, including Nintendo Game Boys, Nintendo Entertainment Systems and Commodore 64s. Pulsewave has been running ever since and has been booked at all-ages DIY venues all over Manhattan and Brooklyn. Spring is springing, birds are chirping and booties will be shaking! Come out of the cold and bump da party with us! Chromacle is a digital art and music project created by Jake Beadenkopf to explore the plane of the digital aesthetic, creating vast computerized video and audio experiences that dance the border between logical data constructs and ocular corruption. Working under the mantra "Beauty from corruption, destruction from chrominance," Chromacle's work deconstructs the digital to its barest form. The product is a glitch-influenced barrage of visual and audiological stimuli that tantalize and torture physiological receptors. Cream in all Moustache aka Alexandre is a French boy fascinated by underground culture. After several shows in France and a US TOUR with C’n’B label, CIAM developed his real own style, digging the deepest sounds from his 2.3 cartridge, always trying to push away the boundaries of chiptune. futurestack is a visual artist who likes 1bit, high quality dithering and old technology. Professionaly he does vfx for broadcast and film, and at night he draws and messes with electronics that most people consider garbage. He’s been using pretty much the same computer since 1987. The folks at Mayfield are walking and raising money to fight multiple sclerosis (MS) as part of Walk MS this coming Sunday, April 28, and throwing open their doors to host a party, too (donations all going to the cause, of course). This issue is very near and dear to ILFA's heart, so here's hoping this post brings in a few more donations. It is with great honor and pleasure that we announce this years plan for the MS Walk 2013! We've decided that this year, along with the usual walk across the Brooklyn Bridge, we're gonna throw the party at our restaurant Mayfield With the unbelievable love support we've received over the last 8 years this is our opportunity to not only say thank you, but to start a new tradition in our fundraising efforts. We'll be closing Mayfield on Sunday, April 28th for a pig roast, taco party and beer fest after the walk. We've managed to get some various donations from some of our food and beverage purveyors along with volunteers to work the event so 100% of the money goes to the MS walk. Below is a link to our donation center and the details of the event. There, you can donate and sign up for the walk. There is no requirement to do the walk to attend the party. We are asking a suggested minimum $40 donation for the party that can be made through the same link. Please email us directly if you are planning on attending. Please share it with friends, family and anyone who you know who might be interested in donating and/or participating in the festivities. There will also be an opportunity to donate at the event. Thank you again for your continued support. It truly is an amazing thing. 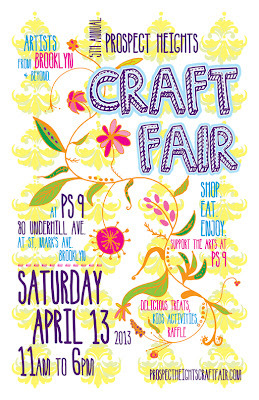 The SOS Crown Heights annual talent show takes place today (Saturday) at PS 289 on St. Marks and Kingston. Check it out! - Tastebuds introduces their new chicken biscuits this evening. - 739 Franklin hosts their one-year anniversary party on Saturday night. 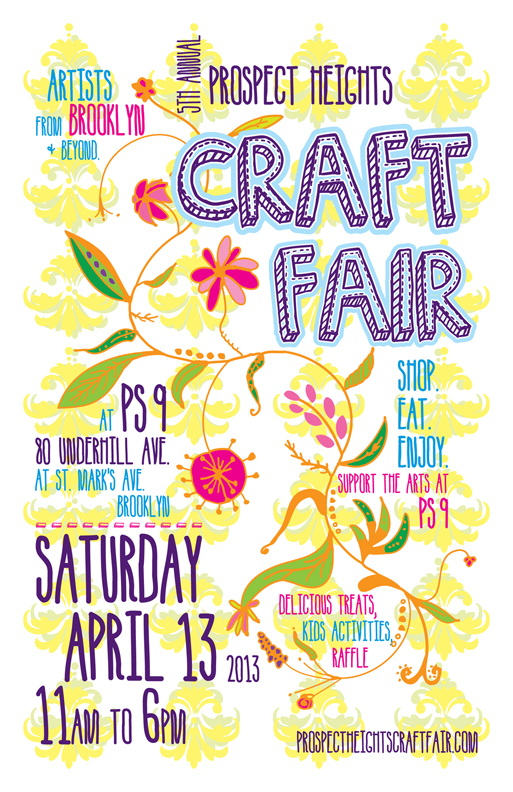 - The Prospect Heights Crafts Fair kicks off a summer season this weekend. 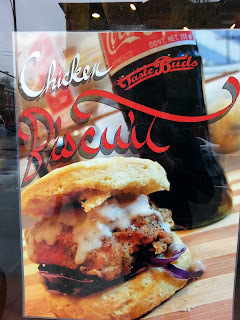 - Glady's is open at Lincoln and Franklin (and the Brooklynians approve). Anybody been yet? For the simple reason that people enjoy eating, Tom Stathes has curated rare food-related animated cartoons from the 1910s-1940s. 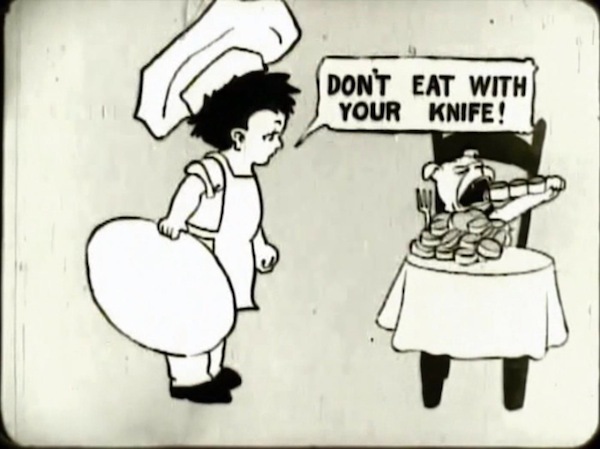 Come and experience the latest Cartoon Carnival screening--shown in real 16mm film, with a real projector--a unique experience you'll be sure to remember! Tom Stathes is a "Cartoon Cryptozoologist", with a rare film print collection comprised of over 1,000 shorts. His archive consists of everything from Felix the Cat and Farmer Alfalfa to silent reels from Bray Studios and Out of the Inkwell. A native-New Yorker, he turned his passion for the city’s animation legacy into a preservation mission. With his Bray Animation Project, he has worked with several film and comic historians to document the studio’s invaluable output. For more information go to cartoonsonfilm.com or brayanimation.weebly.com. 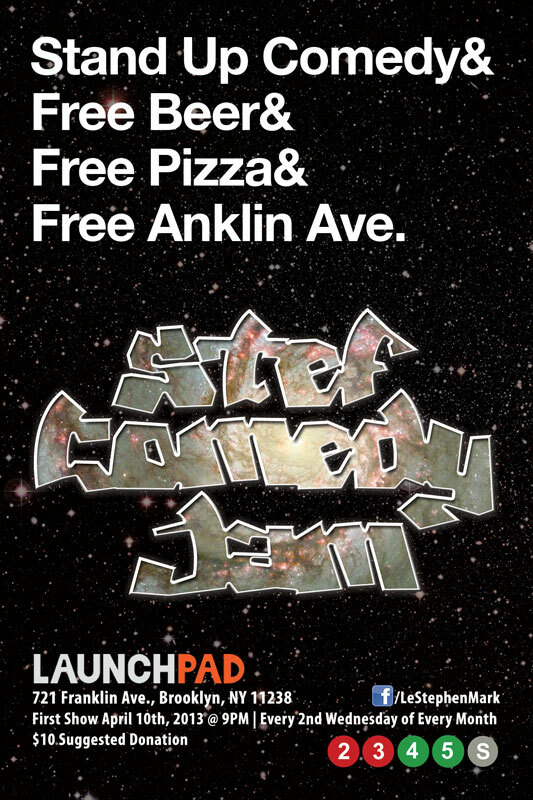 Sounds & Sounds is a concert series at LaunchPad that explores new music and new forms of improvisation. Nico Soffiato's "O.S.T. Quartet" + "Kaplan/Merega/Moffett Trio"
Many thanks to Kingston Avenue resident Alisa Gumbs for putting together this dispatch from Kingston Avenue and sending it to ILFA last night. I'm thrilled to be able to run it (photos to be arranged within the post shortly). 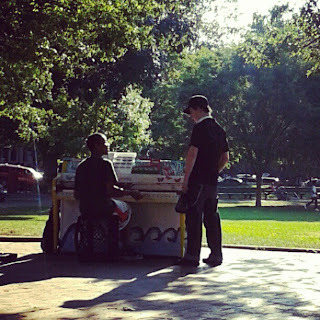 Guest posts and great ideas are always welcome! 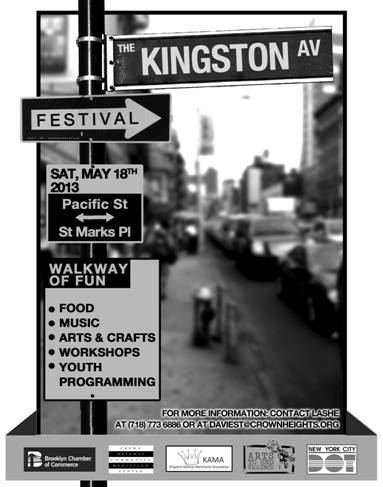 UPDATE: The First Annual Kingston Avenue Festival will be taking place Saturday, May 18 (see the flyer above from the KA-based Crown Heights Community Mediation Center). If you haven't spent time on Kingston before, this will be a great day to start. 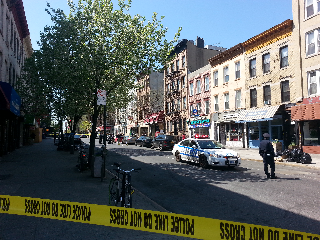 Inspired by ILFA’s annual roundup and resolution to report on more of Crown Heights (and also by the blog chatter charting the waves of change from Franklin to Nostrand and beyond), I’ve put together a roundup of my own for the past 12 months on my little strip of Crown Heights North: Kingston Avenue between Eastern Parkway and Atlantic Avenue. 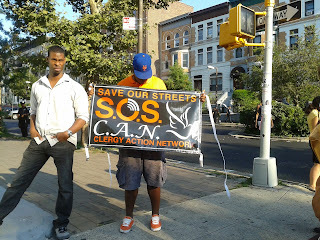 May 19th was “Super Saturday” on Kingston, featuring a block party to kick off S.O.S.’s Arts to End Violence week, “It’s My Park Day” in Brower Park, and block clean-ups on St. Marks on both sides of the avenue. 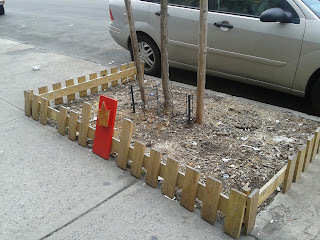 The greening and cleaning continued in June when the Kingston Avenue Merchants Association held a Beautification Day on June 9th that installed tree guards from St. Marks to Atlantic, through a Love Your Block grant. Over the summer, Brower Park once again had a pop-up piano, decorated by students from Bushwick High School for Social Justice. A new mural named “Aspire” was completed on Bergen at the corner of Kingston. Tons of photos of the process can be seen here: http://gnstudios1986.wordpress.com/. The avenue itself got muni meters and was repaved, as were many of the side streets, by the DOT. And those side streets that are part of the Crown Heights North Historic District got their special street signs. 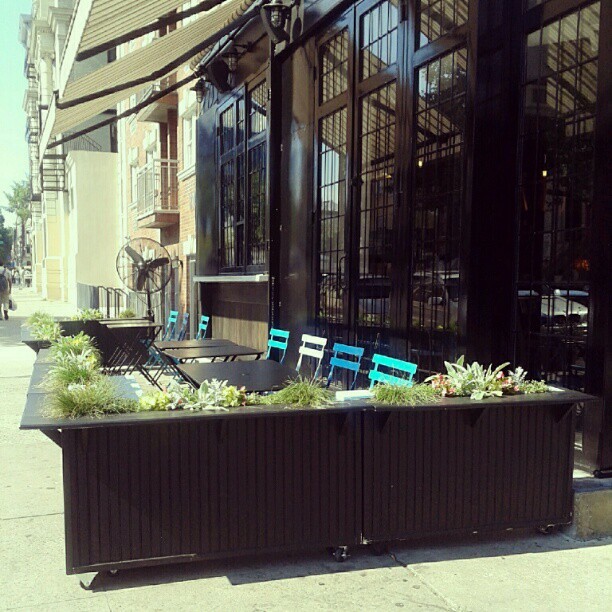 In commercial news, Basil restaurant at 270 Kingston got a sidewalk café; Jackmili thrift store moved from 289 to 239 Kingston (formerly a shipping company); and two bodegas on the same block (125 and 137 Kingston) got glassy renovations and a selection of organic products. Not all the news was good. Sadly, in March there was a shooting at the corner of Kingston and St. John’s and in July there was one at the corner of Kingston and St. Marks. As usual, SOS staged responses to both. And on Aug. 22nd there was a small fire above Better Choice Funding at 133 Kingston. During Labor Day weekend, Kingston and St. Johns was the staging area for the annual Kiddie Carnival, part of the West Indian American Day Carnival. Then Fall rolled in, and with it Hurricane Sandy, which wasn’t as kind to Brower Park as it was to most of the rest of Crown Heights. October saw the opening of Orquidea’s Dominican Salon at 229 Kingston (formerly another hair salon). Just past our northern border, new coffee shop PS Café BK opened on Kingston between Herkimer and Fulton. The year ended with new street trees planted on Kingston between Eastern Parkway and St. Johns as part of the Million TreesNYC program. 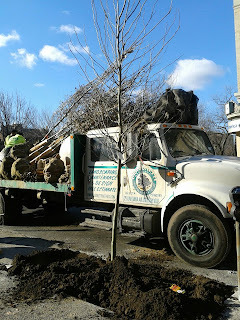 (Those trees got fancy iron tree guards last month.) For the holidays, Friends of Brower Park put on its 3rd annual tree lighting and Y.O. S.O.S. again decorated storefronts as part of its Winter Windows program. The biggest change in the commercial scene came at the beginning of the year: B.H. Tal Real Estate opened at 289 Kingston. But there are still plenty of vacancies. 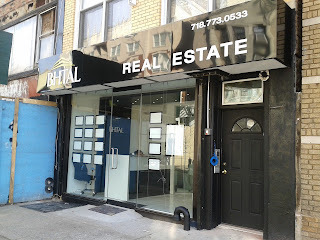 “For Rent” signs are up at the other half of the former shipping company at 241 Kingston, at the former Metro PCS store at 266 Kingston, and at the former Part II Lounge at 259A Kingston. There’s also a “For Sale” sign up at My Cousin's Place, the former sandwich shop at 100 Kingston (though Knick Knacks, a seafood catering/delivery place has been operating out of the space). The list of storefronts that are just plain shuttered is even longer. And then there’s the biggie: Kingston Lounge, which still sits unused and untouched. I heard last summer that the current owners acquired it unseen as part of a parcel of properties and were so overwhelmed with the amount of work it needs that they’re trying to re-sell it. Work is currently underway on 1078 Park Place, on the corner of Kingston, a multifamily that sold in February and will be turned into 10 luxury rentals, according to the owner’s website. Work is also going on at 115-123 Kingston, the beautiful but dilapidated old building at the corner of Bergen with six residential and four commercial units. The construction there led West Indian restaurant Arthurine’s Kitchen to close and thrift store Grace Communications to move across the street to 102. Rumor is that it's going to be converted to condos. 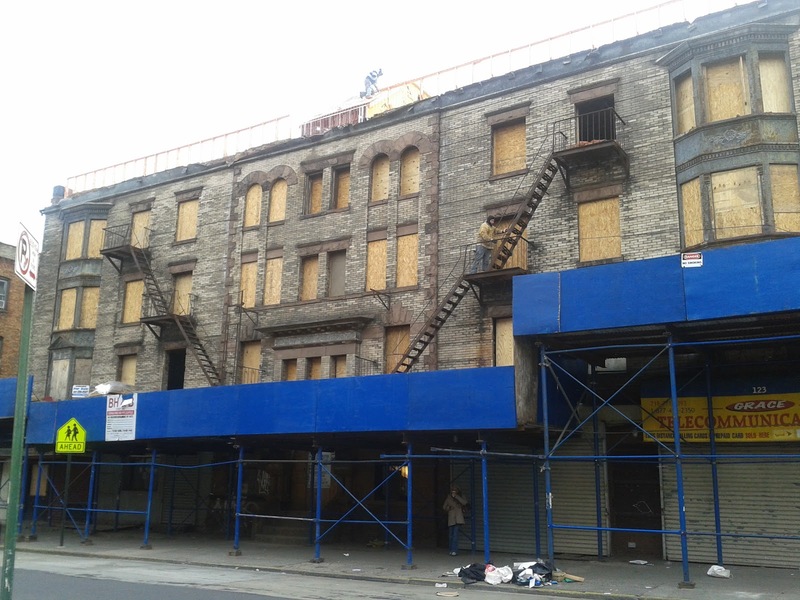 It's not yet landmarked but it’s calendared as part of Phase 3 of the Crown Heights North Historic District, so fingers crossed that at least some of the exterior will be saved. 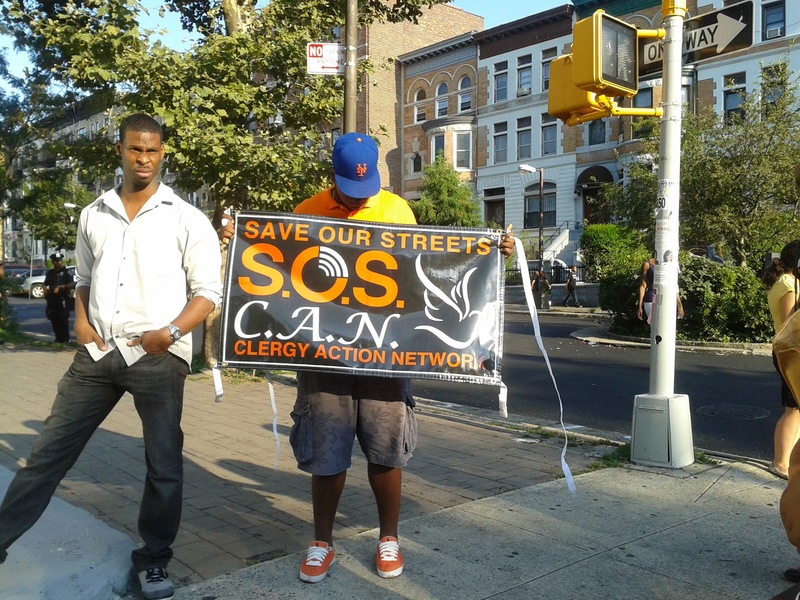 SOS Crown Heights hosts the first in a series of community meetings aimed at ending violence tomorrow night at their home on Kingston Avenue. While I'm guessing these conversations were in the works well before the CHCA Town Hall, it's inspiring to see local organizations taking their message public and listening to their communities. Swing by tomorrow at 6pm to learn about the great work SOS is doing, and to make your voice heard in the ongoing struggle to prevent and end violence. We're launching our 5th year of lit, laughter and liquor at Brooklyn's favorite neighborhood hangout with return appearances by three of our most popular alums, HEIDI JULAVITS (The Vanishers), FIONA MAAZEL (Woke Up Lonely) and TEDDY WAYNE (The Love Song of Jonny Valentine), a preview reading of one of summer's most anticipated novels by DAVID GILBERT (& Sons), and nonfiction from critic, essayist, and Slaughterhouse 90210 mastermind MARIS KREIZMAN! And the fun includes super cheap booze, giveaways and an awesome book raffle! HEIDI JULAVITS is a founding editor of The Believer magazine and the author of four critically acclaimed novels: The Vanishers, The Uses of Enchantment, The Effect of Living Backwards, and The Mineral Palace. She is a Guggenheim recipient, and her work has appeared in Esquire, Time, The New York Times, McSweeney's, and other publications. FIONA MAAZEL is the author of the novels Woke Up Lonely and Last Last Chance. She is a winner of the Bard Prize for Fiction and a National Book Foundation "5 Under 35" honoree. She teaches at Brooklyn College, Columbia University, New York University, and Princeton and was the Picador Guest Professor at the University of Leipzig, Germany. She lives in Brooklyn. TEDDY WAYNE is the author of the novels The Love Song of Jonny Valentine and Kapitoil, for which he was the winner of a 2011 Whiting Writers' Award and a finalist for the New York Public Library Young Lions Fiction Award, the PEN/Bingham Prize, and the Dayton Literary Peace Prize. The recipient of an NEA Creative Writing Fellowship, his work regularly appears in The New Yorker, The New York Times, Vanity Fair, Bloomberg Business Week, and McSweeney's. He is a graduate of Harvard and Washington University in St. Louis, where he taught fiction and creative nonfiction writing. He lives in New York. DAVID GILBERT is the author of the story collection Remote Feed and the novel The Normals. His stories have appeared in The New Yorker, Harper’s, GQ, and Bomb. His next novel, & Sons, will be released in July 2013. He lives in New York with his wife and three children. MARIS KREIZMAN is the creator of Slaughterhouse 90210, a popular blog that combines her love of literature and television. She is also the editorial director of digital content at Barnes & Noble. Previously, she was the audiobooks editor at eMusic and a book editor at Free Press/Simon & Schuster and Counterpoint/Basic Books. A graduate of the University of Pennsylvania and the Radcliffe Publishing Course, she lives in Brooklyn.